When The Act of Killing, Joshua Oppenheimer’s deeply disturbing documentary about the perpetrators of the 1965 Indonesian genocide, was released in 2012, there were more than a few critics who made rather serious charges against it. The main point was that in giving voice to the killers, Oppenheimer was being exploitative and completely irresponsible, that in fact the film was validating the views and actions of these murderers. That accusation, made from a safe geographical and cultural distance, failed to consider the larger context in which the film had been made. As Oppenheimer has frequently said, the initial impetus for the project was the realization that Indonesia today suggested what Germany might have been like if the Nazis hadn’t been defeated and the perpetrators of the Holocaust were still around and in power, openly celebrating their part in the slaughter. In Indonesia, the men who killed perhaps a million “communists” – that is, anyone who disagreed with the military dictatorship of Suharto which, with Western support, had seized power from President Sukarno and eventually lasted for three decades – not only live openly, but are celebrated. Among their victims were members of the communist party, labour organizers, many ethnic Chinese, and ordinary people who managed to offend the killers for some reason. Although instigated by the new regime and supported by the military, most of the killings were perpetrated by civilians and paramilitaries, enabling the government to claim that it was a popular uprising against the supposed communist threat. The legacy of the massacres has never been dealt with because the perpetrators have never been called to account. Fear of further violent action by these people kept the victims and their families silent for more than four decades, forced to live alongside the men who slaughtered their relatives and friends. Oppenheimer started to gather material about this lasting legacy in 2002-03, beginning with friends whose families had been among the victims. This was a dangerous undertaking, posing risks both for him as a filmmaker and for his friends as subjects. For these people to expose themselves by speaking up could easily make them targets of renewed violence. It wasn’t long before he discovered that the now-aging killers were quite willing to talk to him about their actions, in fact that they were proud and boastful about the killings. And why not, when their society still presented the slaughter as a positive thing, the salvation of the nation from the horrors of communism. In schools, kids were being taught that the victims were violent and evil and that the killers were heroes. And so Oppenheimer began to concentrate on the killers. His approach was to allow them to create for themselves on film their own narratives about the killings, self-serving stories shaped by memories of the movies they’d loved as young men. The resulting film is a chilling immersion into the minds of men who could still smile and joke and laugh about the horrific things they had done because their society validated those actions. One of the most disturbing sequences in the film shows a group of these killers appearing on a television talk show to celebrate the anniversary of the massacres, with the perky host cheerfully asking them to describe in detail the techniques they used to kill “communists”. As the film progresses, however, we begin to discern cracks in the psychological defences of one killer in particular; the time and effort spent in thinking about and re-enacting his crimes seems to produce at least a small degree of self-awareness and perhaps the beginnings of a conscience. In a larger sense, the finished film has initiated a kind of awakening in Indonesian society. It was a largely underground process, with secret screenings, but it began to permit people to give voice to what had remained suppressed for decades. This process is the focus of the companion feature Oppenheimer released in 2014. The Look of Silence had to be made before The Act of Killing was released because it required continuing access to people who would turn against the filmmaker once his larger project became visible. This second film, with its emphasis on the victims of the genocide, may perhaps alter the opinion of those who were negative about the first film – together the two of them form a single work which views those events and their social and psychological consequences from complementary angles. 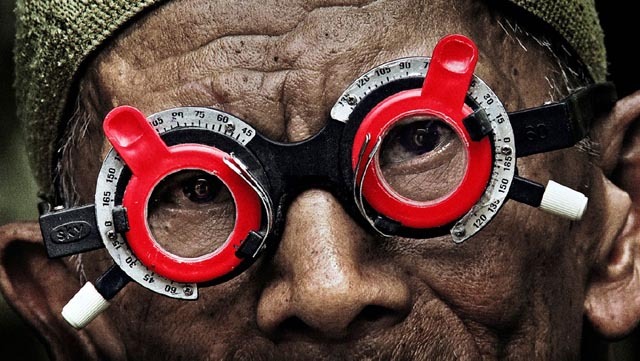 At the centre of The Look of Silence is a 44-year-old man named Adi. He was born in 1967, two years after his brother Ramli was killed. As an optometrist, Adi found himself compelled to speak to older people as he tested their eyes, asking what they remembered of the massacres. We get glimpses of different responses, of people who deny it happened, or who say that it didn’t happen here, but perhaps further down the road. We gradually become aware that he isn’t simply looking for details; he is looking for awareness, for signs of conscience. Through Oppenheimer’s connections with the killers, Adi gets to meet a number of these men. His manner is quiet and calm, and yet beneath the surface there is a determination which refuses to flinch or back away. In one early scene, as he tests the eyes of an elderly killer who was at the bottom of the hierarchy, he eventually provokes anger, an accusation that he is asking questions much deeper than those the man had previously answered for Oppenheimer. While he is entirely open about his part in the murders, he becomes resistant to any attempt to force him to examine the moral implications of his actions. This becomes a pattern repeated throughout the film. When Adi finally meets the family of the man who was in charge of killing his brother, they deny any knowledge of what their husband and father had done, despite the fact that the man had written and illustrated a book depicting the murders he took part in. Like many others, this man’s sons tell Adi that it was all in the past and he should just let it go. Late in the film Adi speaks to his mother’s brother and confronts him with the fact that he served as a jailer for those waiting to be taken to the Snake River, where they were butchered with machetes. Among those prisoners was Ramli, the man’s own nephew. The uncle becomes more and more defensive, saying that he killed no one, that he didn’t know what was happening to the prisoners … and finally falling back on the classic “I was just following orders” excuse. Adi returns home and tells his mother about her brother’s involvement; she had never heard this before. In one of the final confrontations, Adi meets with an elderly man and his daughter. He asks the man to describe what he did and, like others earlier in the film, he says that he would take a glass and drink the victims’ blood because this was the only way to guarantee that the killers wouldn’t go mad from what they were doing. As he says this, the camera observes the daughter’s face; this is something she has never heard before, a whole new level of horror … and she tells Adi that her father is senile and begs him to forgive the old man. Unlike the killers themselves, she apologizes for their actions and asks for forgiveness. A terrible, fraught emotional connection is made by these two figures from the generation which followed the slaughter. 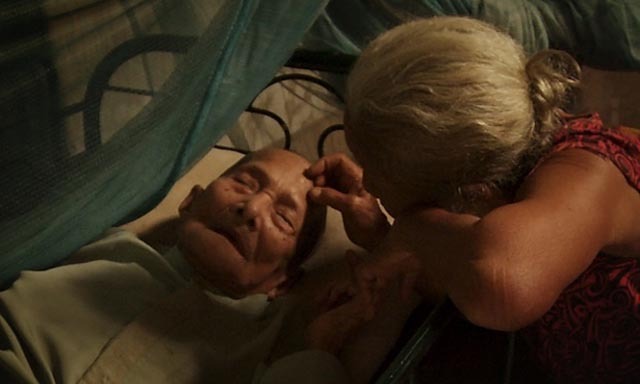 It is this and other moments like it which make The Look of Silence a more appalling, yet deeper and more moving film than The Act of Killing. Where the earlier film was steeped in the garish kitsch of the killers’ view of themselves, the second film is often stunningly beautiful, its images depicting a place which could almost be paradise, a garden into which far too many snakes have made their way to spread their evil. The tension between visual beauty and moral horror evokes large and complex emotions in the viewer which go far beyond the impact of mere reporting. As befits the title, the film is full of silences, some contemplative, many heavily weighted as conversations stall when they get too close to dangerous truths. But even then Adi’s calm, persistent presence refuses to allow those truths to slip back out of sight, although it’s clear that this is exactly what the people he’s talking to really want. It is in such silent moments that Oppenheimer’s sensitivity as a filmmaker shines, as his camera moves back and forth between Adi and the other person as if following a conversation, but instead revealing the undercurrents passing between them. There are moments when The Look of Silence is almost unbearable to watch, and yet the presence of Adi himself, that calm, quiet presence seeking something positive in the horror, anything which might permit the beginnings of reconciliation, offers a note of hope. That note turns out not to be illusory. Unlike the secretive underground distribution of The Act of Killing, The Look of Silence received a public premiere in Jakarta sponsored by two government agencies. Although it is no longer safe for Oppenheimer to visit Indonesia and Adi and his family had to move far from their original home, this film, and the one which preceded it, appears to have opened up a dialogue about the past which may begin a process of healing which was forestalled for five decades by the silence imposed by the murderers and their political backers. Another criticism of The Act of Killing was the lack of reportage on the genocide and the West’s part in it. While it was true that the film didn’t delve deeply into this apart from passing references, its larger purpose was to make visible the consequences of the killers living openly in society, with their ongoing intimidation of the survivors, which made that particular political element a side issue. In The Look of Silence, Oppenheimer deals with it succinctly by including an absolutely horrifying NBC news report from the time, which offers a glowingly positive account of the “victory” over communism, the benefits of cleansing Indonesia of hundreds of thousands of undesirables, and the establishment of concentration camps which allowed at least one American corporation to benefit from slave labour rather than having to pay workers a living wage. The audacity of this television report just two decades after the defeat of the Nazis and the Nuremberg trials is stunning. It concludes with the reporter speaking to one of the killers at the site of a massacre, listening approvingly as the man explains that Indonesia is more beautiful after the slaughter of the “communists”. The Drafthouse Films Blu-ray of The Look of Silence supplies an image rich in colour and detail, and a subtle soundtrack which uses natural sounds and moments of silence to reinforce the psychological impact of the material. The commentary by Oppenheimer and executive producer Errol Morris is a fascinating conversation, not only about the very particular difficulties and dangers involved in making the film, but also about the art and craft of documentary filmmaking … rather of filmmaking, period. There is also a 40+ minute Q&A recorded after a screening at the Berlin Film Festival, with Oppenheimer in conversation on stage with executive producer Werner Herzog; an 18-minute interview with Oppenheimer; and a 30+ minute feature about the premiere in Jakarta, at which Adi makes an appearance and receives a long standing ovation. This last also includes a press conference with human rights activists and the reactions of various audience members following the screening. Inevitably, there’s a degree of overlap and repetition in these supplements, but they add valuable information about the context of the filmmaking and the response to both films in Indonesia itself. The Look of Silence is one of the finest Blu-ray releases we’ll see in 2016. This entry was posted in Commentary, Review and tagged Directors, Documentary, Politics, Violence. Bookmark the permalink.